You are currently browsing the tag archive for the ‘Sir Michael Hopkins’ tag. 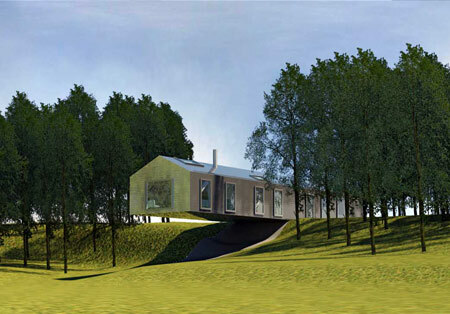 Dutch architects MVRDV’s design for a cantilevered holiday home in Suffolk, UK. We all admire heroic acts, but this is one I hadn’t expected. Author Alain de Botton (Consolations of Philosophy, The Art of Travel, among others) is commissioning architects to build purposefully experimental homes that he will make available for holiday rentals on a not-for-profit basis. His purpose is to “to help people get over the dichotomy that modernism equals awful and antiquated equals great”. The houses are designed by leading architects from various European countries and are deliberately experimental. The goal was to challenge preconceptions of what constitutes a holiday home in 21st-century Britain. “The inspiration is the Landmark Trust [which lets interesting historical properties] – for people interested in a good holiday, but also an educational experience while they are in the property,” De Botton claims. He is calling the initiative Living Architecture. De Botton said he was inspired to launch the project when he was researching the Architecture of Happiness, his book and TV series which is a tour through the philosophy and psychology of architecture aiming to change the way we think about our homes. Visitors will be given an information pack about each building’s design, setting out what the architects hope to achieve, the historical precedents for the design and its influences. Alain de Botton’s project, Living Architecture, can be viewed in more detail here.